This special event was scheduled over two nights to allow members of Oregon’s legislative session more than one opportunity to attend. Faculty and students of Willamette University, as well as the general public are also invited. 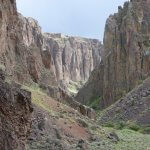 This is a multi-media, non-partisan event, intended to inform the audience of the rugged beauty and diversity of the region called the Owyhee, by way of story, in a richly illustrated program.